A buddy comedy set in a struggling fitness club where mayhem ensues when a new owner arrives with the grand scheme to save the gym by turning it into a reality show. An American Journalist uses every chance to gather first-hand News materials from a terrible rioting in Urumqi, China, leading her into a struggle in her decision on whether or not to report its gruesome details. Jake spends most of his time playing videogames indoors until his mum decides to give him a present. One Hundred Mules Walking the Los Angeles Aqueduct (Artist’s Cut, 2015) is a documentary of a journey with a string of one hundred mules, that drew a line, between Los Angeles and a major source of its water in the Eastern Sierra. This one-month meditation and artwork was undertaken by Lauren Bon and the Metabolic Studio to commemorate the centenary of the opening of the Los Angeles Aqueduct on Nov. 5, 2013. Mules were an important component of the labor force that made the building of the aqueduct possible. This artist action paid homage to the quiet dignity of the mule and the patient pace of its progress across the western epic landscape. Zao is a little boy with an incurable disease, in a house beside a lake. A little girl, Cloe, leads through the forest and tells him the legend of the lake monster. 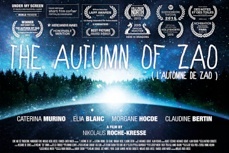 Beyond the pain, death and time, The Autumn of ZAO is a hymn to dream, life and childhood. Dir. by Darrell Langolf Jr.
Amongst the hell of World War I, a temporary cease fire has been issued causing both the Germans and American troops to work together or starve. James Winston, a seasoned veteran, finds his fellow comrade injured on the outskirts of no mans land. In order to save his life, Winston must seek out help with the most unlikely individual, a stern German soldier named Hans Stucher. An elite security firm gets more than they bargained for when they uncover a failed Cold War plot that has just become a modern day nightmare for the city of New York. "Can't Say No" is a visually stunning, other-worldly music video for the band REBEL HOUSE RADIO. This video was directed and edited by Michael Makara who has created pre-visualization for big budget films such as Transformers and the Narnia Trilogy. This visually dazzling music video follows a man who is madly in love with someone who only reciprocates his feelings when it is convenient for her, leading us through a fantastical voyage into his psyche fueled by his intense emotions. Complete with high end Red Dragon camera work, top notch CGI, and even underwater shots, this video explodes off the screen from the very first note.